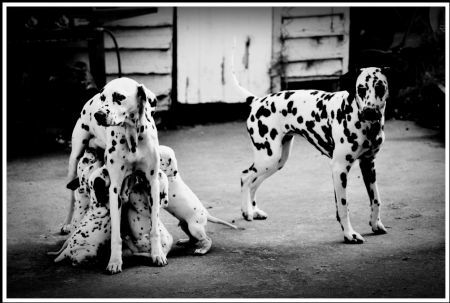 Neilros Dalmatians is a newly established kennel based at picturesque Frankford in Northern Tasmania. Although the Neilros prefix is very new we have had Dalmatians for nearly 14 years and have been showing for much of that time, making some great friends along the way (both the human and canine kind). Our dogs are very much family pets, living in our home, sharing the couch and sleeping on the beds if they get half a chance! I had the privilege of raising two litters of Dalmatians for Sarasota Kennels (also in Tasmania) over the years since purchasing my first Dalmatian from there. My first Dalmatian Aus Ch Sarasota Porche was purchased as a puppy and has since gone on to produce quality progeny with the ability to breed on through generations. Porche is the grandmother of my current show team. The first litter bred under our own prefix, Neilros, arrived in late 2013, producing some lovely pups who have gone on to show homes or have made wonderful family pets. Puppies and young adult dogs are available occasionally so please feel free to contact me if you are looking for a wonderful new addition to your family.